Image courtesy of Bored Panda, shared by permission with Imaginary Garden With Real Toads. Thanks to Hannah at Imaginary Garden With Real Toads, we learned about salt flats today. They are called “the world’s largest mirrors,” and you can read more about them, as well as see more examples of the Salt Flats, HERE. 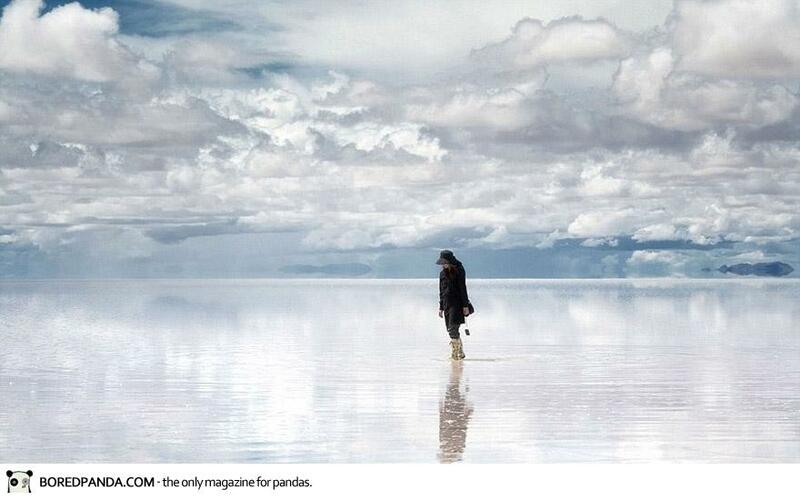 This woman, dressed up and traversing the salt flat, struck me as lonely and careworn. The couplets came naturally, and when I read about the iambs and other rhythms at dverse poets, I realized that I had, indeed, come up with a poem that displayed the rhythm (I think) of the trochee, which is the mirror sister of the iamb. TA da TA da… anyway, I’m posting it and am very happy that I was able to fulfill a form prompt. it is real, a labyrinth that dwells deep and swells wide. Sofia. Your witness is simply being; your song is of the soul. I had written this poem for Sofia, the daughter of my friends Daniel and Joy, during a visit to San Antonio years ago, but it never saw the light of day until this blessed move to our new home next to our church. My posting will be sporadic, but I’ll read more than I post for a few days on breaks from unpacking. This is at dverse, Poets United, and the garden I have sorely missed, Imaginary Garden With Real Toads. dverse asked for Anaphoric poems, which have repeated words or sounds. I decided to use the name which became a song for playtime: Sofia. Three-quarters of the way through April’s Poem a Day for National Poetry Writing Month! Today, Grace (AKA Heaven) of Imaginary Garden With Real Toads asked for “lunes.” I chose the Kelly Lune form, an American haiku form based on syllables (one line of five, one line of three, last line of five; in a single stanza or multiples of same). The Collum Lune is based on number of words: Three, Five, Three; however, that form is for another day! The irony of having at least some words for what happened yesterday does not escape me. But Imaginary Garden With Real Toads asked for a Roundel or Rondelet. Of course, I looked back and the prompt and realized my syllable count is not right, but I think it IS uniform. A poem with a repeated refrain, and you know what? To hell with the rest of the form! THANK YOU, Toads, for giving me an avenue for words to express my grief. As for the “thief,” I don’t want him/her/them put to death. Jail for a lifetime to ponder this tragedy is much worse punishment. Cinquains – Amy tackles a form! Tony at dverse presented the weekly “form for all.” I had written some a long while back for Real Toads, but Tony’s explanation of the guidelines – to write with intention; to place meaningful words at the end of a line, rather than a transitional word or hyphenation that makes the 2-4-6-8-2 syllable scheme add up mathematically… these helped me develop a new appreciation of the Cinquain. I hope my poems reflect his guidance! Also, today (March 14) would have been the 90th birthday of my mother, Charlotte. I miss her so. Imaginary Garden With Real Toads gave us a form to work on, the Cinquain, sort of like haiku, but with a different syllabic structure (five lines; 2 – 4 – 6 – 8 – 2). Its inventor was the American poet Adelaide Crapsey. I wrote three: one funny, one environmental, and one about our praise service at church. Enjoy. If I didn’t make the deadline (often the case! ), it will be shared on Real Toads’ Open Link Monday! Process notes below. NOTES: Cinquains ideally have a nature theme, similar to haiku; however, Americans generally disregard this, as is our nature. There are other suggested rules, and I didn’t bother with those either. See, I’m more of a “free-verse” kind of woman, and after years of songwriting, being constrained to any form makes me all twitchy. But for Real Toads, I did my best! Also on the right scrolling column of my poetic haven, Poets United. ** Old saying: When you sing in church, you pray twice. Once with words and again with the joyful noise of rhythm and voices! The prompt at Poets United’s Thursday Think Tank is “Music.” Hey, what an opportunity, right? Here is a song from my CD, Jazz Baby Hits Her Stride. You can hear me sing it if you click on the link above. Summer’s here, or so it seems. Shining sun – the stuff of dreams. not a trace of snow to see. flannel-clad from head to toe.